0.1 There was a time when Gran Canaria was pigeonholed as an island for the bucket-and-spade brigade. This side of the new millennium, Gran Canaria’s rediscovering its glorious past as the retreat of choice for health-obsessed visitors of wealth. 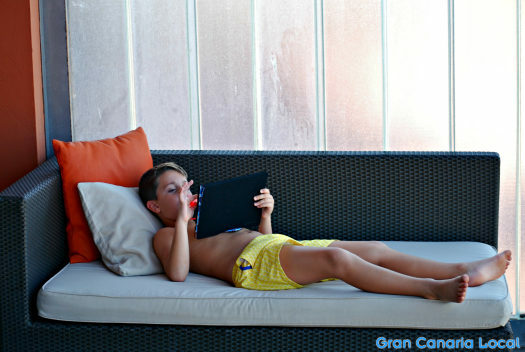 With Sheraton Gran Canaria one of the island’s new breed of old-school spa hotels. There was a time when Gran Canaria was pigeonholed as an island for the bucket-and-spade brigade. This side of the new millennium, Gran Canaria’s rediscovering its glorious past as the retreat of choice for health-obsessed visitors of wealth. With Sheraton Gran Canaria one of the island’s new breed of old-school spa hotels. If you’re a Gran Canaria Local regular, you’ll know the score by now. As we’ll first reveal how to get to the Sheraton Gran Canaria and then offer an overview of their facilities and services. Finishing off with descriptions of what you can eat and drink there. 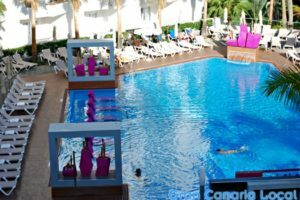 The Sheraton Gran Canaria Salobre Resort, to give the hotel its full name, geographically lies within Maspalomas but is in reality roughly halfway between that resort and Puerto Rico further west. It’s actually located in its own self-contained development. As in Urbanización Salobre Golf. 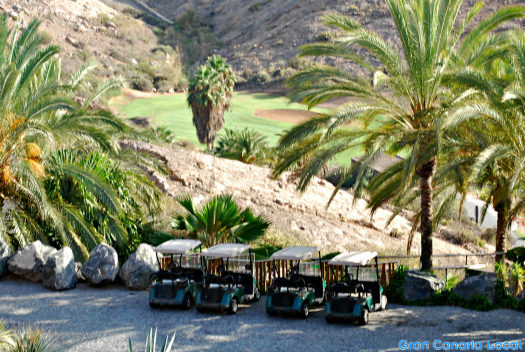 It will take you just over half an hour along the GC-1 to reach the Sheraton Gran Canaria from the airport. There are no nearby bus stops, so we recommend renting a hire car to get you there. If you fancy a break from being behind the wheel, however, a taxi will set you back around 50€. There are 313 rooms and suites at this five-star Sheraton conforming to the chain’s signature style. Indeed, it looks as fresh faced as when it opened in 2006. We stayed in a sixth-floor suite whose terrace looking north we enjoyed most, especially when treasuring the sunset with a bottle of bright and light Castell d’Ordell semi-dry cava. 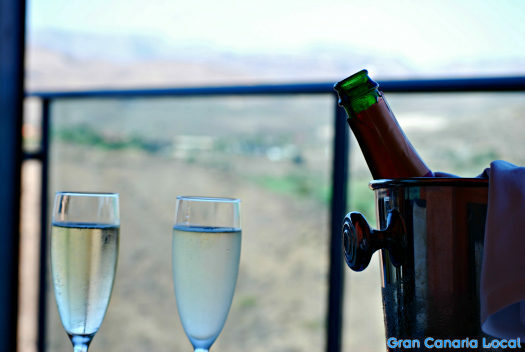 At the time this review went live, TripAdvisor ranked the Sheraton Gran Canaria as one of its top 10 Maspalomas hotels. We enjoyed the easy access to the splash pools on levels four to seven. As well as appreciating the adults-only infinity pool on the top 11th level which include Balinese beds you can hire for 35€ a day (with bottle of cava thrown in). There are two 18-hole golf courses, but our interest in the sport starts and ends with watching the Ryder Cup on the telly. So we stuck to the pools instead. Although we did accept an invitation to the Night Spa (35€), a Tuesday and Saturday evening fixture at Aloe Wellness, where we started off with some yoga before more of the bubbly stuff was served and guests were left to their own devices with an outdoor bijou thalassotherapy circuit and indoor clothing-optional Finnish sauna and eucalyptus-scented steam room. Despite the temptation to enjoy a weekend of pure leisure, we brought our laptop with us. The free Wifi enabled us to get some work done. There are also non-coin-operated desktops close to the reception if you want to pack lighter. 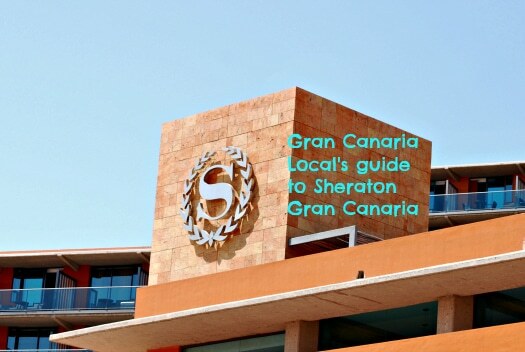 There’s a luxury vibe to the Sheraton Gran Canaria. And so, of course, you’re offered cava on arrival (soft drinks are available for the under-18s). 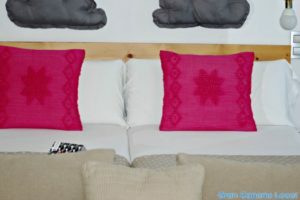 The wait for our room was certainly more pleasurable given the reception topping up our glasses when we ran dry. 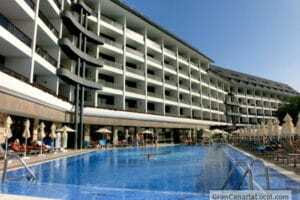 Sheraton Gran Canaria is not an all-inclusive hotel. So apart from the cava at reception and in the buffet restaurant at breakfast, you have to pay for any drinks you order. These include ones accompanying your meal (both alcoholic and non-alcoholic beverages). The aforementioned Sunset is the place to go for cocktails in the hotel with a classic list including twists on staples such as Sangría (10€) made with your choice of red wine, white wine, or (you guessed it) cava. 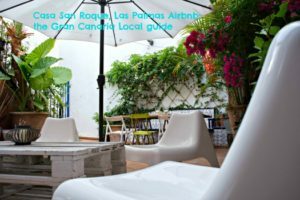 Although they are also served at another pool bar, the La Palmera. Including Bailey’s Passion (8,80€), a devishly refreshing blend of Baileys, vanilla ice cream, and chocolate syrup. 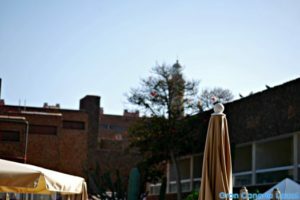 The main Gofio buffet restaurant has been sensationally reborn as Sens Kitchen Patio Garden with a restructuring which has seen the creation of more outdoor spaces, taking advantage of the fact there’s little difference between temperatures when the sun goes down as when it’s got its daily hat on. We loved the smoothies prepared while you waited at breakfast with the choice of adding the likes of plum, melon, and strawberry to an orange-juice base or, for those with a more adventurous palate, such ingredients as ginger, mango, and celery. 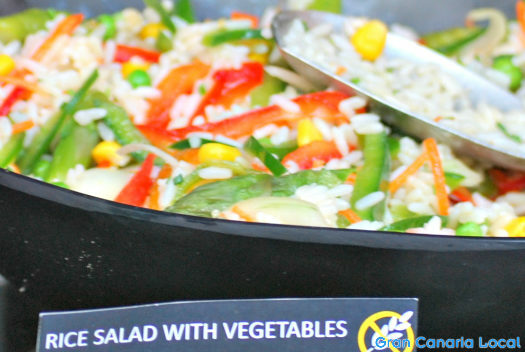 Everything was colourful such as the sweets in tuck-shop-style jars and clearly marked like the vegetarian rice salad at dinner. Elsewhere, the á-la-carte Camaleón offers a contemporary take on the traditional trattoria with Canneloni di Gamberi (15€) stuffed with a coconut milk and curry combo. Along with Stewed Veal Ossobuco (18€) with gremolata and pumpkin puree. Another dish to catch our eye was the Fennel Salmon (19€) accompanied by grapefruit and a celery-turnip puree. 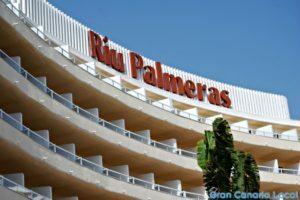 Disclaimer: We were invited to stay on a half-board basis at the Sheraton Gran Canaria for the purposes of writing this review. Reserve in advance directly with the hotel to secure the Best Rate Guarantee. For more info about this, visit the hotel’s website.